Premier League football fans seek genuine connections with their favourite clubs and players. SnapRapid’s ongoing analysis has revealed that fans are fostering such connections on Instagram at an impressive rate. This trend is crucial for clubs and their sponsors, as the high engagement rates on Instagram drive sponsorship ROI more efficiently than Twitter. When comparing Twitter and Instagram, we see very clear differences in potential impressions and engagement. On average, images and videos with Premier League shirt sponsor exposure generate nine times the number of potential impressions on Twitter than Instagram. This is firstly testament to Twitter’s retweet functionality, as impactful images and video can easily be shared on the platform. It is also testament to the platform’s dominance as a source for news and information for fans. However, fans engage with Instagram content featuring their favourite clubs at nearly three times the rate than Twitter on average; it is common for images and videos posted by the official Instagram accounts of clubs such as Arsenal and Manchester United to receive well over 100,000 likes each. This is far higher than the retweets and likes generated by similar posts on Twitter. Fans respond strongly to visual content that showcases their passion for their favourite clubs. They are not looking only for official matchday photos or press conference recaps, which tends to dominate Twitter. They respond enthusiastically to creative content that takes them behind the scenes and lets them feel more closely connected with their favourite players and managers. Fans also want to develop connections with other fans. Instagram’s dominance as a visual content platform allows them to connect across language barriers. For sponsors that are able to tap into the high rate of engagement on the platform, a photo on Instagram is truly worth a thousand words in many languages. Instagram allows creative fans to communicate their passion more easily than they can on Twitter. High-quality imagery will resonate with fans and allow them to connect without the need for a common spoken language. Despite Twitter’s photo-and video-sharing functions, audiences are generally more fragmented on the platform by language or region. Despite Twitter generating the lion’s share of potential impressions, SnapRapid has measured incredible audience growth for the Premier League and its sponsors on Instagram. For first half of the season, the number of total potential impressions on Instagram remains relatively stable between August and November. Potential impressions then jump up by over 227 per cent in December. 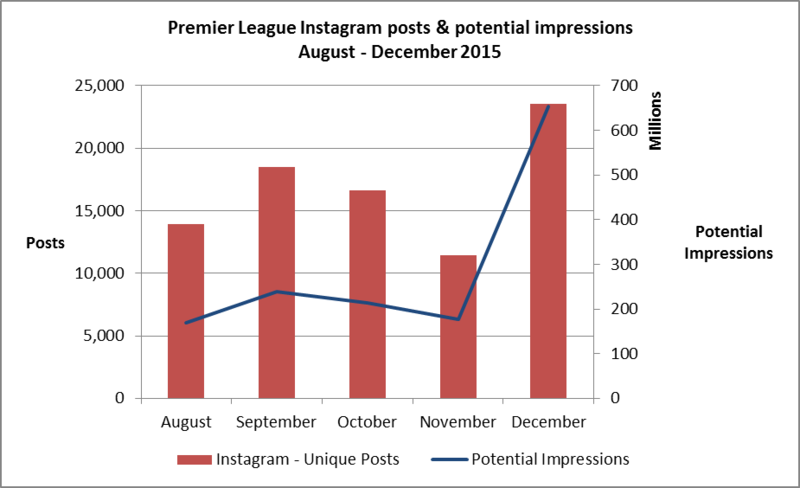 This growth was driven largely by the adoption of Instagram by more fans, as evidenced by rapid increase in followers for the official accounts of Premier League clubs. Since the start of the season, the official Instagram accounts of several clubs have shown a huge increase in followers, including popular clubs such as Arsenal and Manchester United. 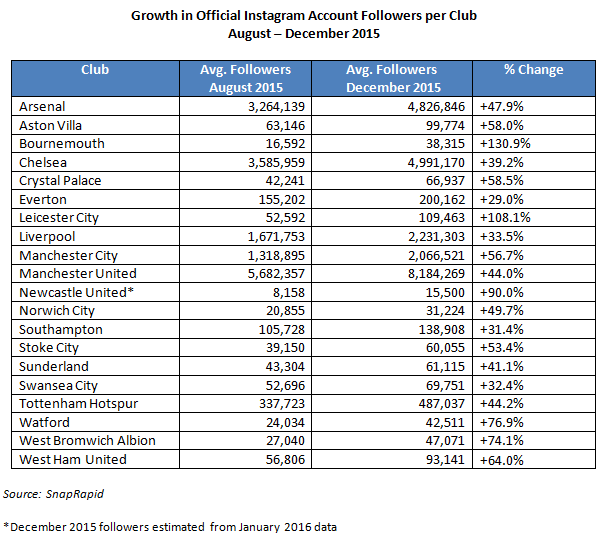 Premier League clubs saw a 58 per cent increase in followers on average from the start of the season to December 2015. Many sponsors and sport marketers still use CPM (cost per thousand views) as an advertising value equivalency measurement to quantify the ROI of sponsorship. Under this model, Twitter is still by and large the most valuable platform for Premier League clubs and their sponsors. However, using a CPE (cost per engagement) model to calculate advertising value equivalency gives an accurate measurement of the number of fans who took time to interact with visual content. This metric also provides sponsors with data on how many individuals were truly exposed to their brand. Instagram easily outperforms Twitter under this model, and the platform will certainly become more valueable for clubs and sponsors as fans continue to log in and engage in droves. We expect that the number of football fans adopting Instagram will continue to grow into the next season and beyond. It is imperative that clubs implement visual tracking measurement to measure the true value of their sponsorship.